Need a display that is ready when you are? Our portable display solutions are economical and offer the flexibility to set up in moments. Some options are best for short term signage while others offer the convenience of traveling with you without taking up a lot of room. Our newest table top display is the ARCH. It features a contemporary base that holds a full color sign from 8.5x11 to 11x17. And, you can swap out graphics whenever you like in seconds. 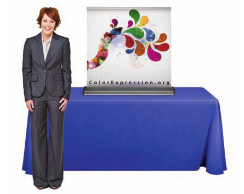 Or, our EZ Seamless Table Top is a larger unit that works perfectly when you need a 6' or 8' across display. Add full color graphics that can be changed out at a moment's notice.